When Santa sets off to deliver the presents poor Bear is left behind. How will he make it to Tom's house in time for Christmas morning? Follow Bear on his adventures as he travels far and wide. 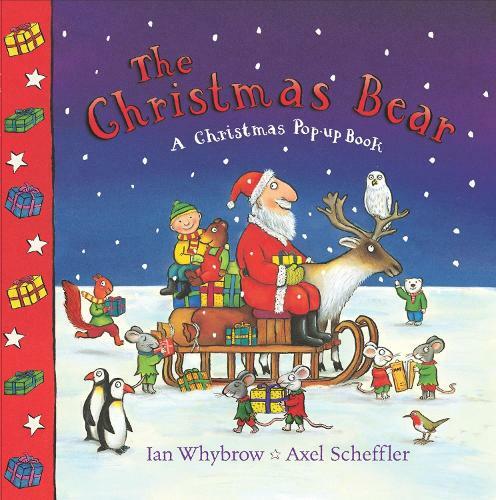 This pop-up paperback book features a laugh-out-loud text by Ian Whybrow that is full of witty rhymes and silly scenarios, and illustrations by Axel Scheffler, illustrator of The Gruffalo. Bursting with funny details, The Christmas Bear is a Christmas book with a difference. Best of all, children can join in the fun with flaps to lift, wheels to turn, tabs to pull and pop-up surprises on every page! Also from Axel Scheffler and Ian Whybrow: The Bedtime Bear and The Tickle Book.